This means that the registered SORS shooter saved it at the time of his first registration all the information about himself (and arms) that the organizer needs to have at his disposal. Signing up for a race (registration itself) is only allowed for users who have created a shooter user account in the SORS system. Users who are not registered as such will not allow SORS to sign up for a race. Signing in to the match is done in two steps. at the bottom you will see two tables: PRE MATCH (PM) and MAIN MATCH (MM). Signing up for the match is done through the appropriate SQUAD. It's up to shooter where to SQUAD is logged on. The SORS system allows so-called migration between SQUAD. Migration means that if a shooter, for example, logs on to SQUAD number 1 and changes his decision later, he can log off (with one click) from the original SQUAD and sign in to another SQUAD. Migration (sign-up or sign-up) is only possible if the relevant SQUAD capacity is not reached or there is no registration deadline (so-called DEADLINE - day D in which you can still sign up for a race). 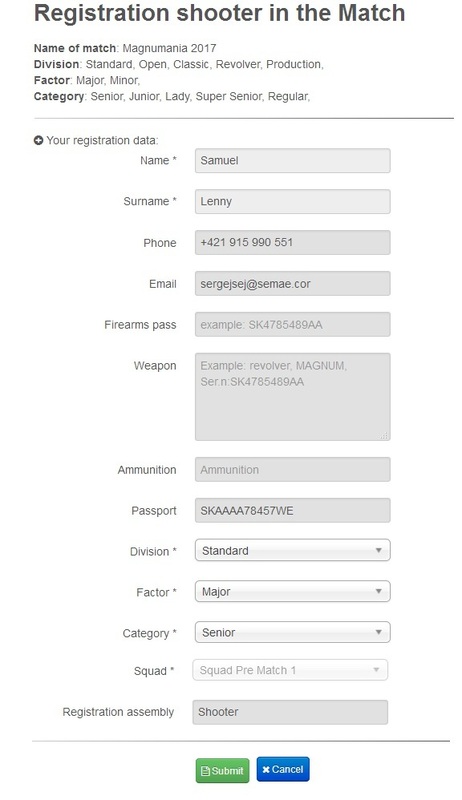 (ie, when you click on the registration to the relevant SQUAD), will be displayed a pre-filled form (which retrieves information from the shooter's account) and it's up to the shooter, if he changes the data (for a particular race under the registration conditions specified by the organizer of the race ), or retains, as the race organizer sets certain criteria for signing up for the race. It is then sufficient to confirm this form (the data from the form is stored) and the system will automatically place you in the race and the relevant SQUAD. This is the end of the registration process (sign-in) for the race.